News now from Rich Lazzara at Lazzara Lenton of a $500,000 price reduction on his central listing for sale, the 35.35m motor yacht Serenity. 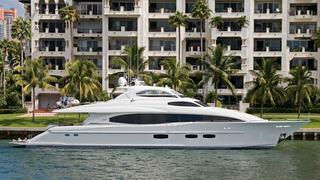 Serenity was built by Lazzara in 2008 to an in-house design, and was refitted in September 2012. She features an open flybridge with hard top, ample seating and tables for al fresco dining plus a full bar, barbecue grill and large Jacuzzi, A spacious, stylish saloon is panelled in light maple with the flooring in golden cherrywood. A formal dining area comfortably seats 12 guests and the galley has a skylight, flooding the area with natural light. Accommodation is for 12 in five staterooms. Below aft, the master suite has a king size bed, vanity area and ensuite shower with two hand basins. The port and starboard VIP staterooms both feature queen size beds and a sliding door between them can be opened to create a a second master suite with his and hers en suite facilities. A twin cabin can be reconfigured into a double and has two Pullman berths. All staterooms have full entertainment facilities and the yacht has surround sound audio throughout. Notably, Serenity is wheelchair friendly and is equipped with a wheelchair lift. Twin 2,000hp MTU engines give her a cruising speed of 22 knots and top speed of 27 knots. Notable touches include a hydraulic swimming platform and twin transom pods for two personal watercraft. Serenity is now down from $8,495,000 to $7,995,000.